So, I’ve been doing these virtual Disneyland visits lately. 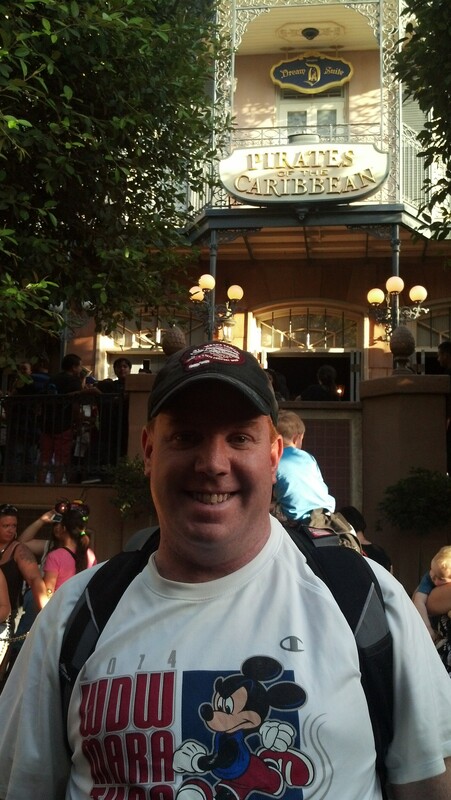 Last Saturday, I finally got to visit Disneyland for real! It was my first visit to the original Magic Kingdom since two days before Christmas! Shocking! I know. 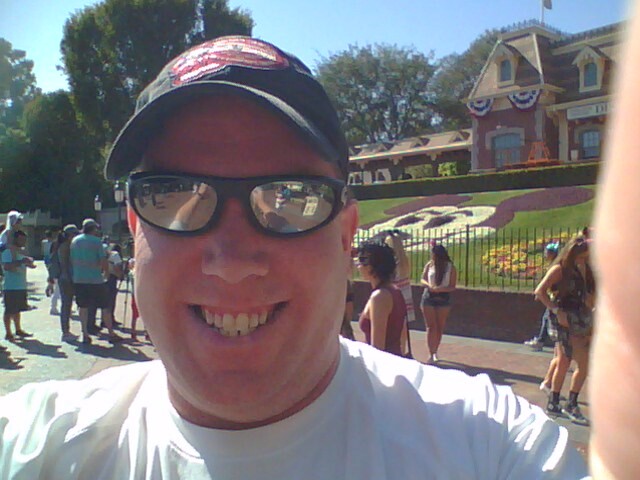 It was also my first trip to any Disney theme park since the day after the Walt Disney World Marathon. I realize that a lot of you who read this blog will probably never start your visit at the Disneyland Resort from the Mickey and Friends Parking Structure. 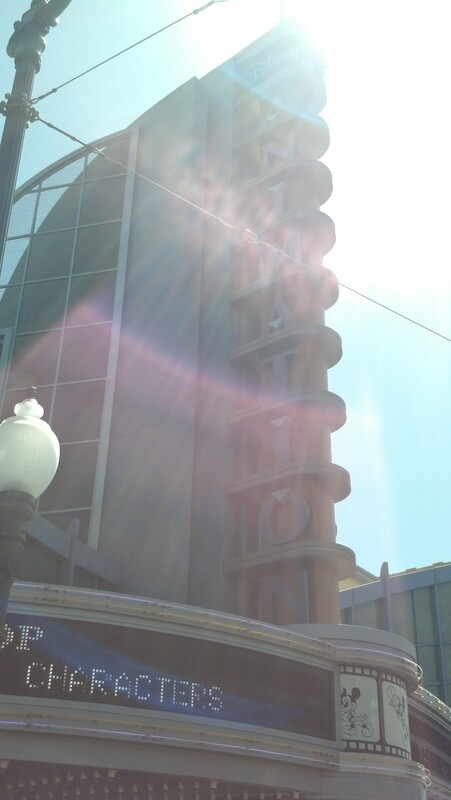 However, if you do, at the tram stop, there is a Welcome sign that changes throughout the year. 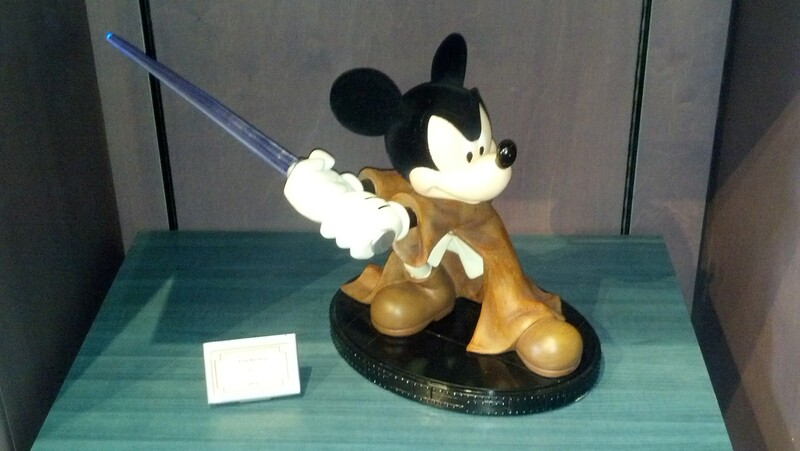 It’s always interesting to me to see what Disney has come up with when I visit. 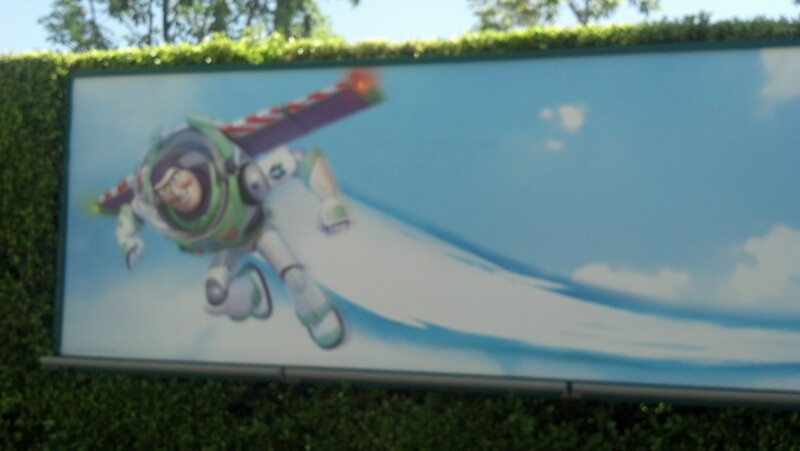 This summer, it appears to be Buzz Lightyear. 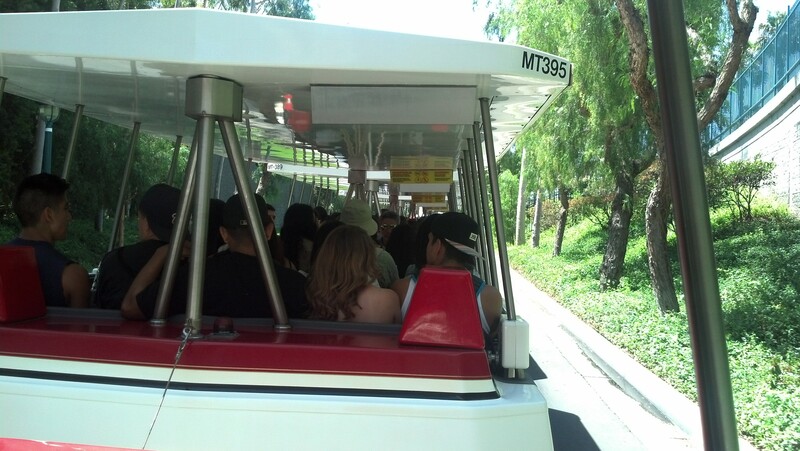 With very minimal wait, Brooke and I were on our first ride of the day…the tram! If you do park in the Mickey and Friends Parking Structure, one thing to remember about waiting to get on a tram…always go to the farthest wait spot from the front of the waiting area. Everyone tends to bunch up towards the front. If you go further back, you’ll have a smaller wait time. The tram drops off in front of the World of Disney store in Downtown Disney. 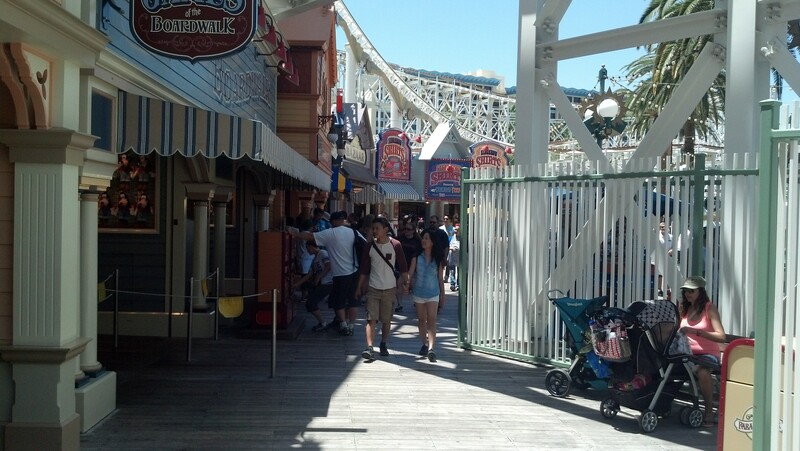 From there, it’s a quick walk to the entrance of the two theme parks. 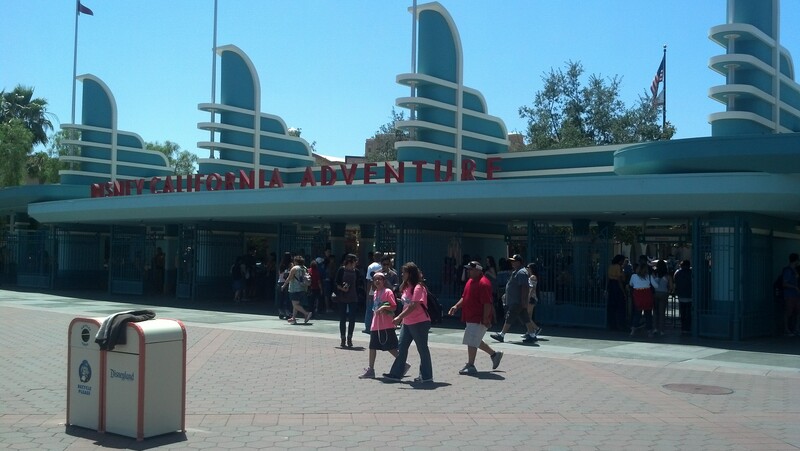 We chose to start our day at Disney California Adventure. 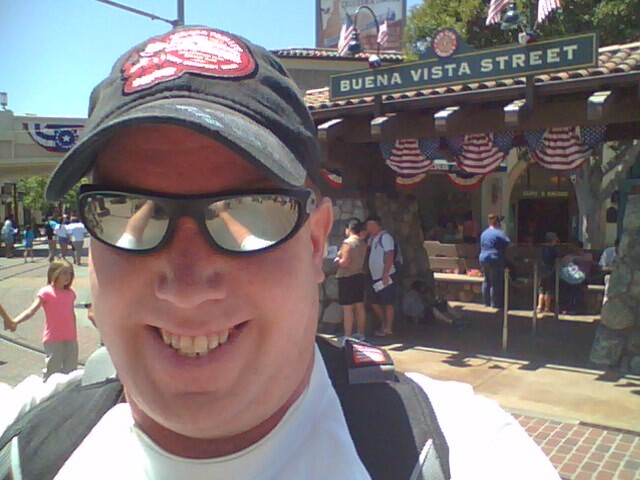 Welcome to Buena Vista Street! It felt great to be in a Disney theme park again! 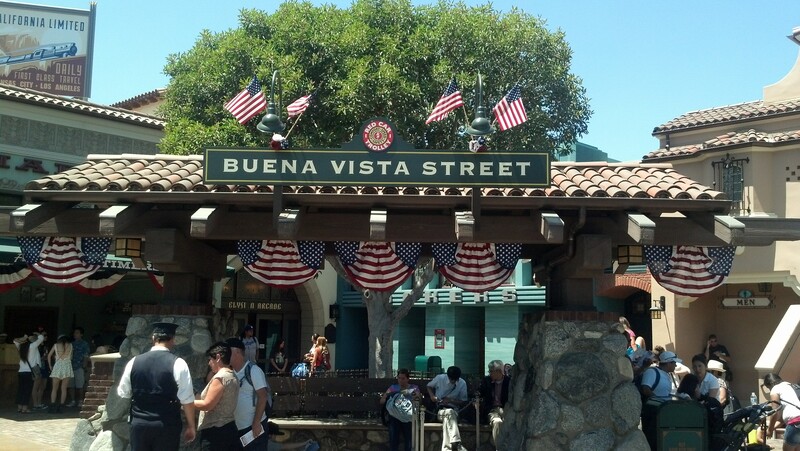 Buena Vista Street is the Main Street U.S.A. of Disney California Adventure. This is the stop for the Red Car Trolley that makes its way back to the Tower of Terror. 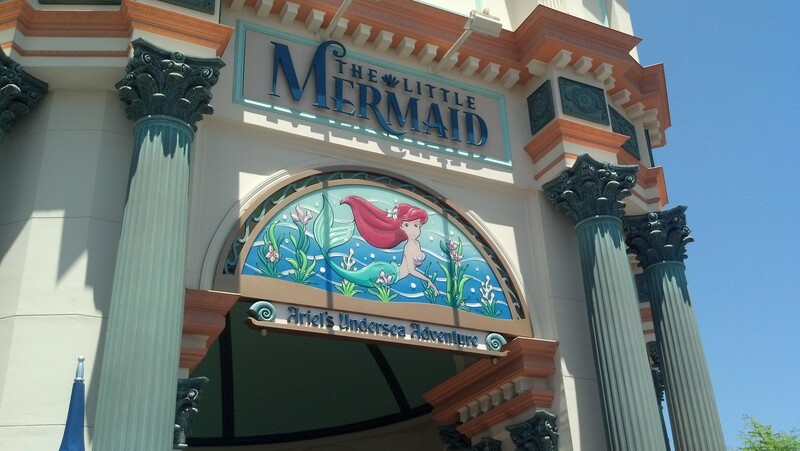 Brooke’s favorite attraction at Disney California Adventure (DCA) is the Little Mermaid: Airel’s Undersea Adventure. We didn’t arrive in the park until 11am. So, given the proximity to lunch time and the wait times at other attractions, we decided to start off with Brooke’s favorite. I said this in my Magic Kingdom trip report and I’ll say it here…the queue line for the same attraction at the Magic Kingdom is completely immersive in the Little Mermaid’s world. The queue line at the attraction at DCA isn’t even close. 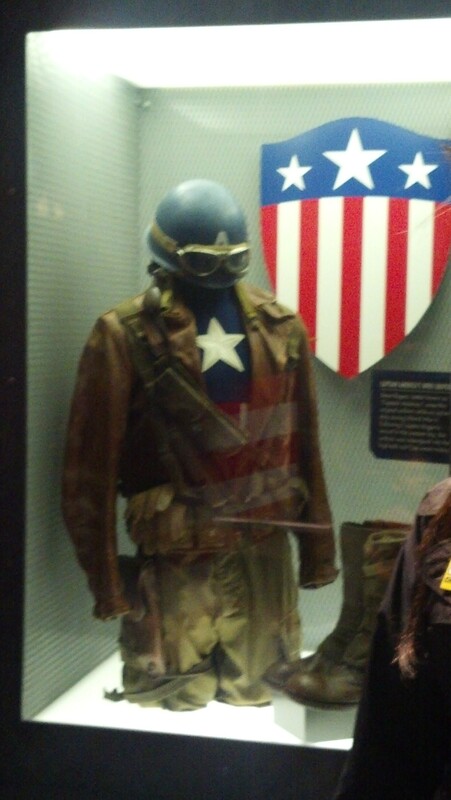 What I love about Disney, however, is how they do the details. The Little Mermaid attraction at DCA has a very open and airy feel to its queue line. 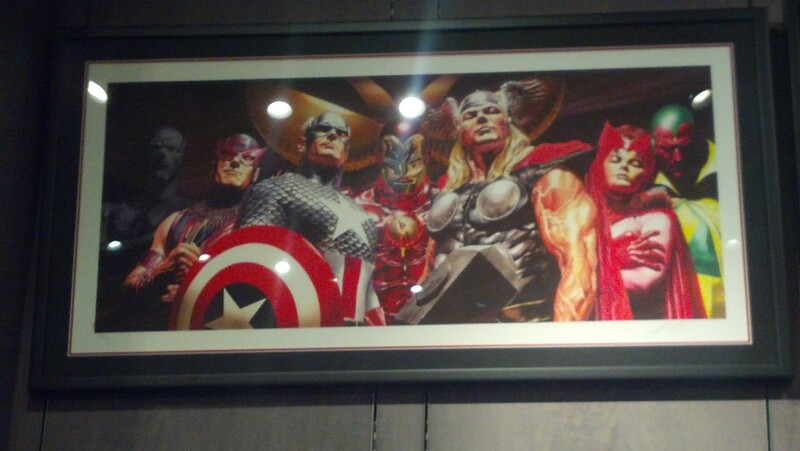 So, the mural pictured above fits that. 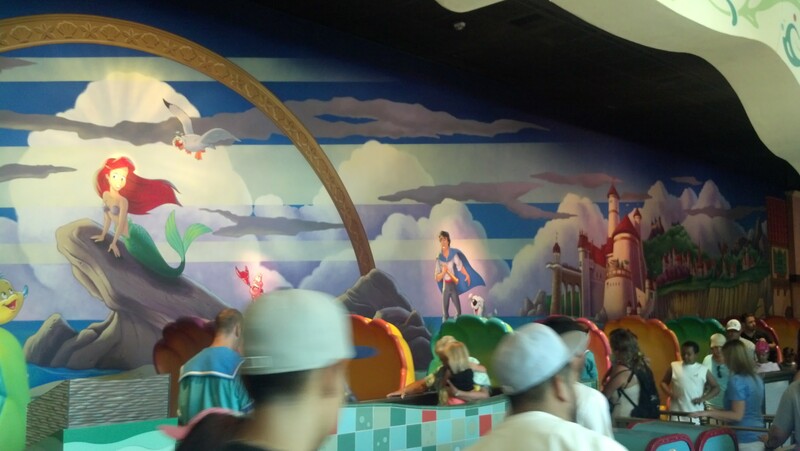 Compare that with the mural at the Magic Kingdom. The queue line takes you through caves. 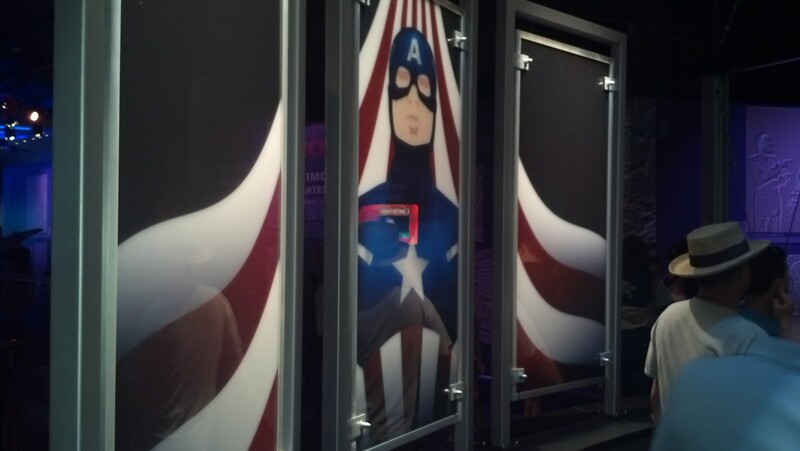 So, the mural is a little more dark feeling. 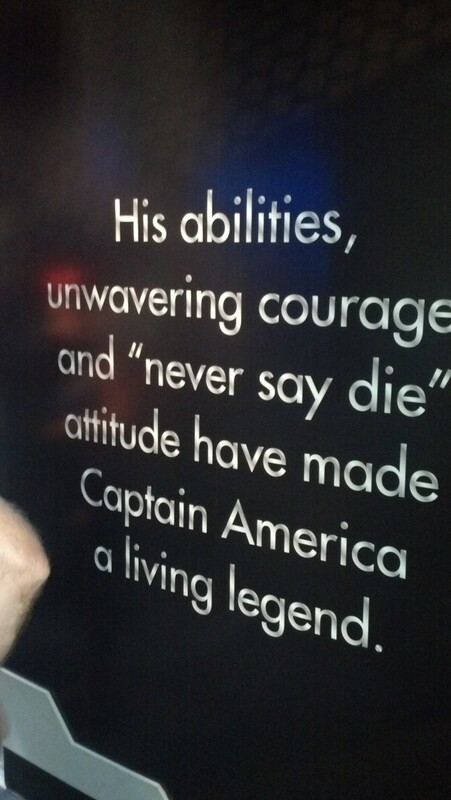 They have recently made some small changes in this attraction that I was interested in seeing for myself. Ariel, when she’s above the sea, no longer has the plastic looking hair. 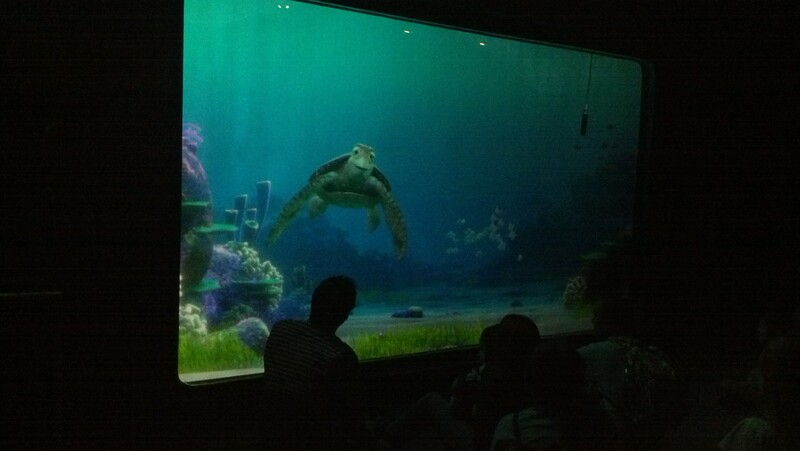 Additionally, in the Under the Sea scene, they have a black light effect that is really cool! 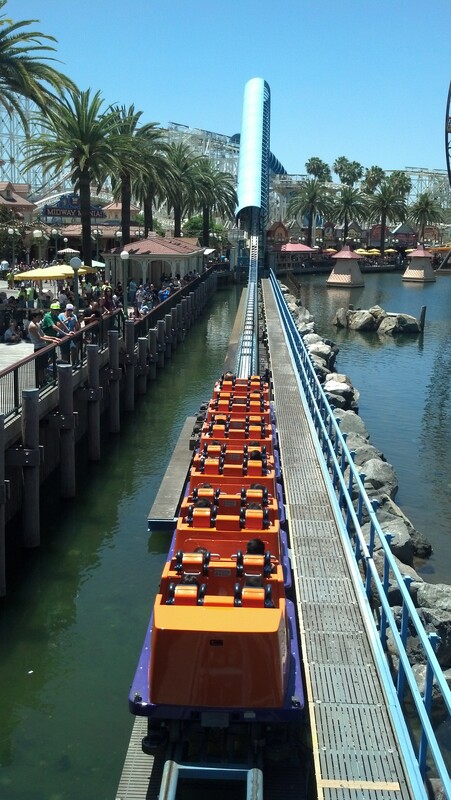 If you haven’t had the opportunity to ride this attraction at DCA in the past month, check it out again. There are a few other differences that you’ll just have to see for yourself. Because it wasn’t quite time to eat lunch and the wait for the Little Mermaid was small, we went on it again. 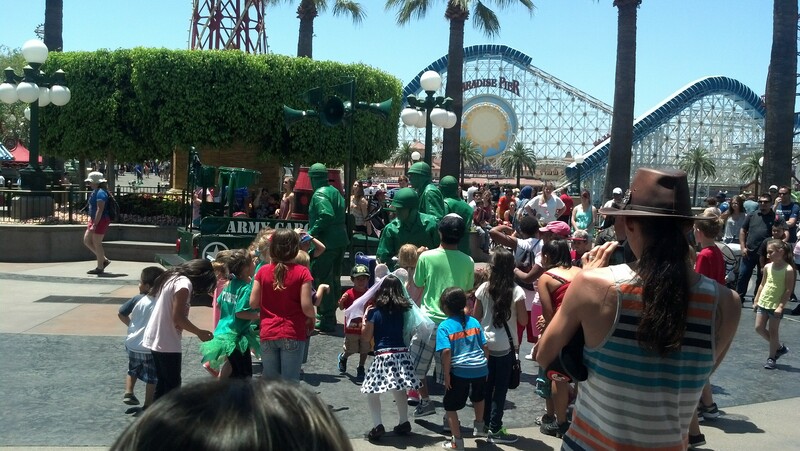 This time, when we got out, we saw the green army guys from Toy Story. They have a little street entertainment short show. Pretty fun! From there, we made our way to Cucina Cucamonga for lunch. 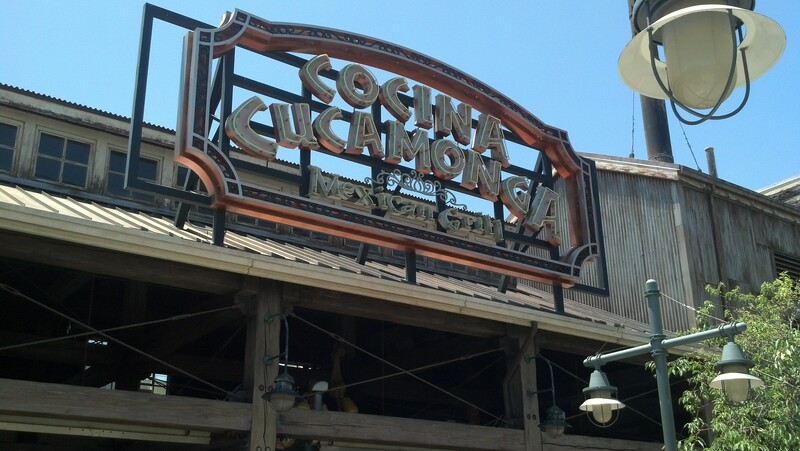 This Mexican counter service restaurant has become my wife’s favorite at DCA. 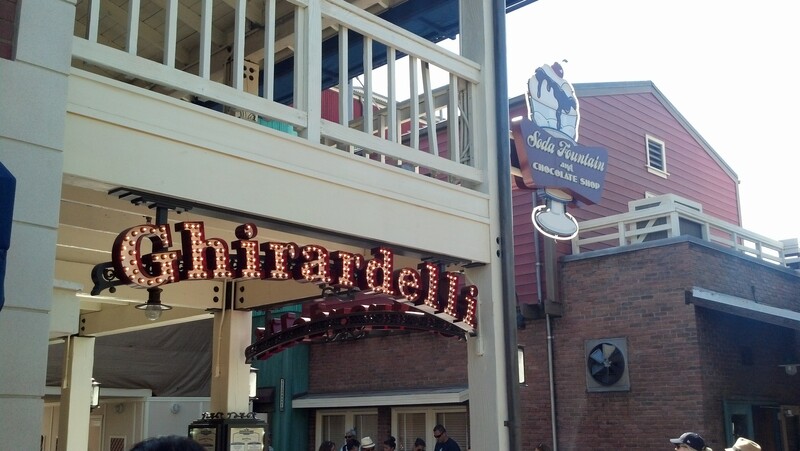 So, whenever we go to DCA, we usually will have one meal here. 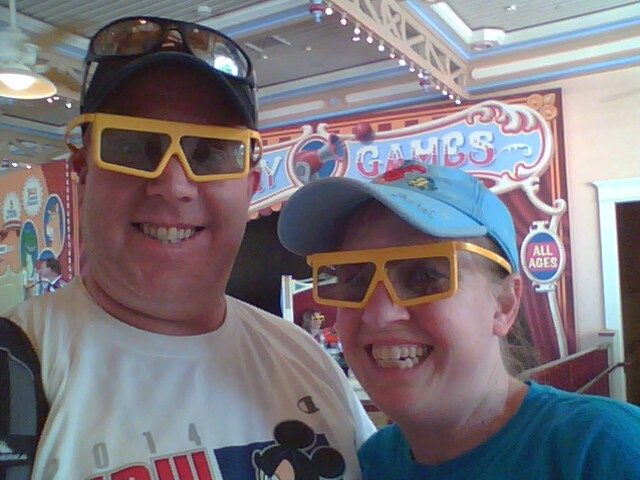 From there we made our way to Toy Story Midway Mania. Along the way, I had to snap this picture of one of the ride vehicles for California Screemin’ getting ready to launch off. 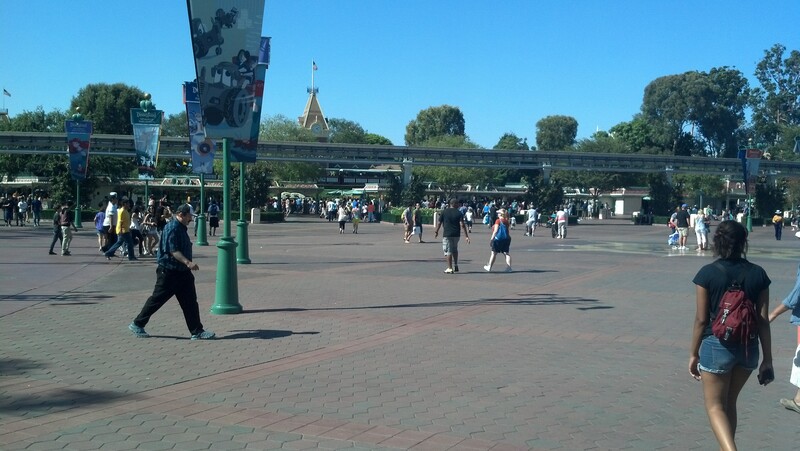 As you can see, the crowds at DCA weren’t too bad. It was busy, but not overcrowded. Until Radiator Springs Racers opened at DCA, Toy Story Midway Mania was my favorite attraction at DCA. The wait was 45 minutes for Toy Story Midway Mania. Unfortunately, the queue line isn’t nearly as fun at its counterpart at Disney’s Hollywood Studios. 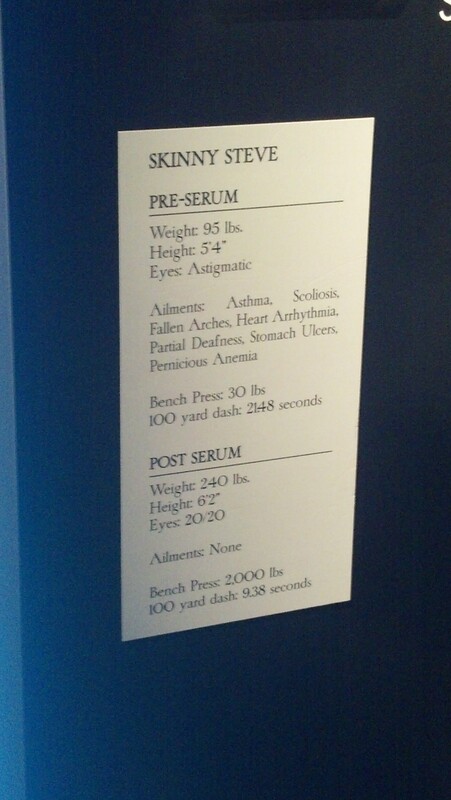 Also, there is no fast pass for this attraction like they have at Disney’s Hollywood Studios. To be honest, I’m not sure why this difference exists. I mean, it’s the same attraction. So, why do they have fast passes in one location and not in the other? Hmmm. 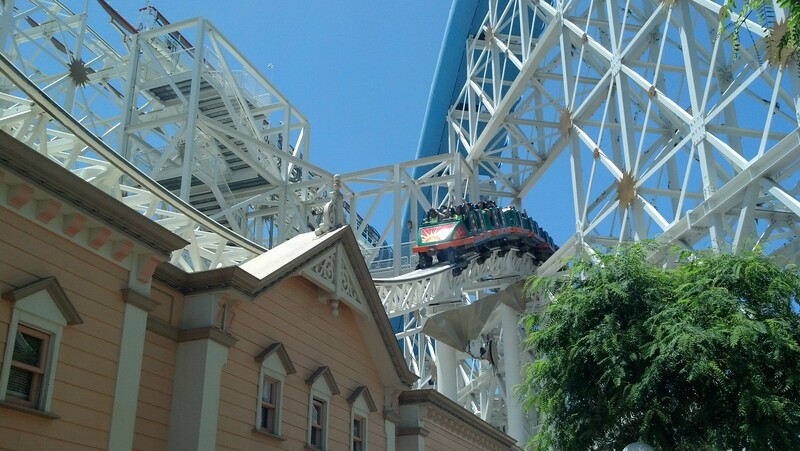 Oh well, with California Screemin’ all round the Paradise Pier, you can sometimes see the roller coaster coming at you while you’re in line for Toy Story Midway Mania. There’s also a nice view of the Paradise Pier scene! Once you get here, it’s almost time to ride! I love this attraction! 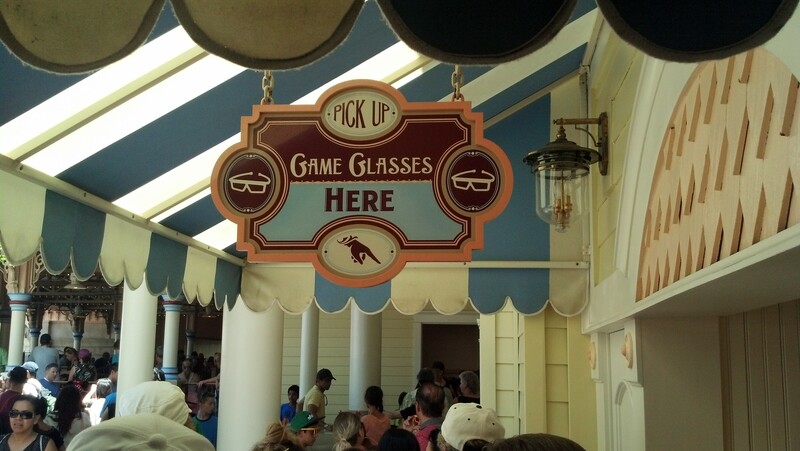 For anyone wondering…a 45 minute wait is quite common during busy days. I personally wouldn’t wait too much longer than this. 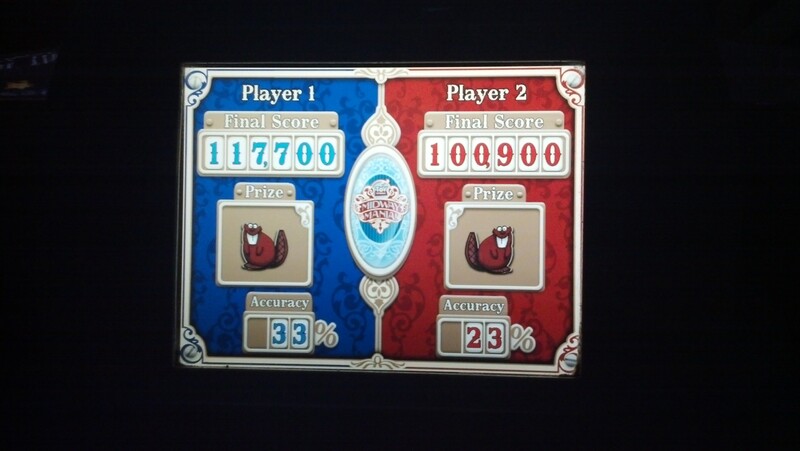 Although, my score wasn’t that bad, Brooke did beat me this time. I was player 2. 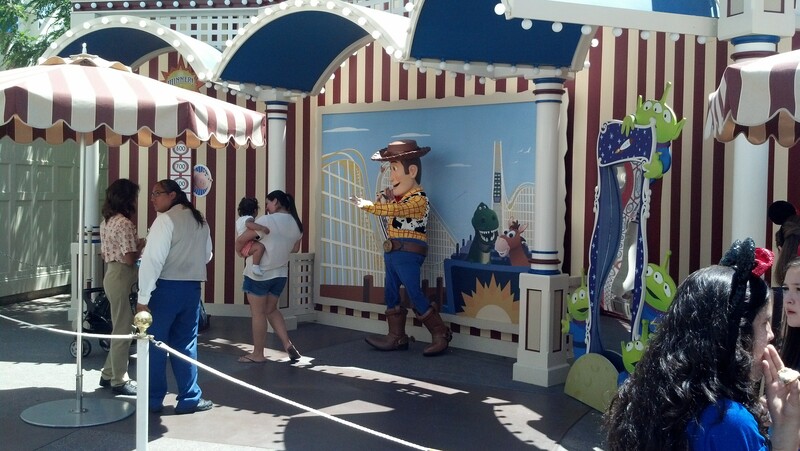 As we made our way along the Paradise Pier, we saw Woody! 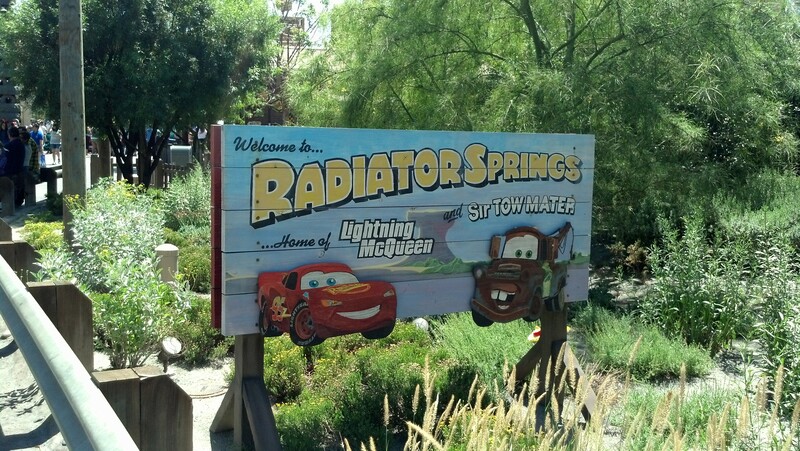 We also saw Lightning McQueen in Radiator Springs…aka Cars Land. 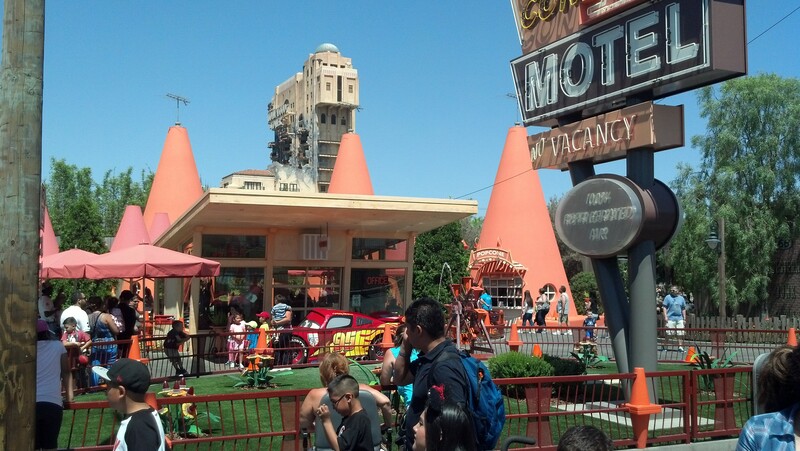 You can get your picture with Lightning McQueen and Tow Mater at the Cozy Cones Motel. 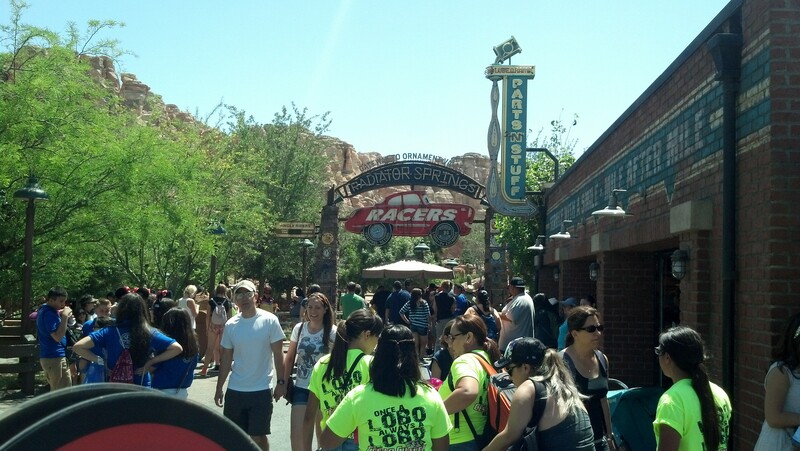 The wait time for Radiator Springs Racers was an hour and a half when we walked by. That was too long of a wait for us. 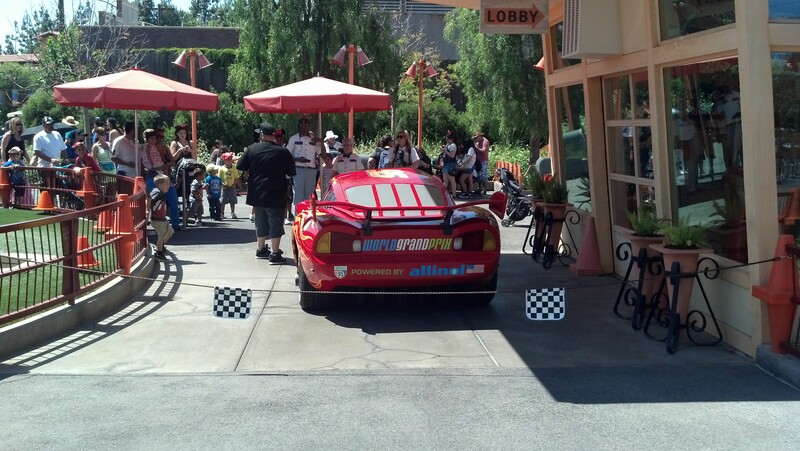 We did spend a few minutes watching some of the racers whiz by in the race section of the attraction. I love the details of Cars Land! 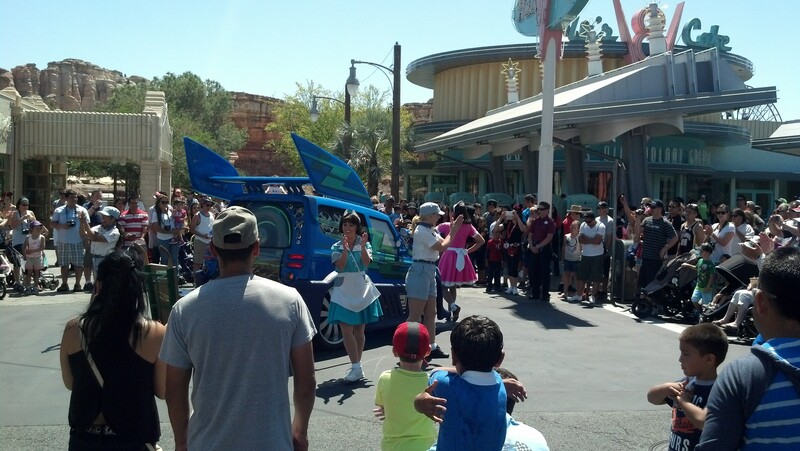 They have a little street performance with DJ in front of Flo’s V8 Café that’s kind of fun. This sign is facing the opposite way from how we were walking. We were walking from Cars Land towards the Tower of Terror. If you walk the opposite way, you see this fun sign. 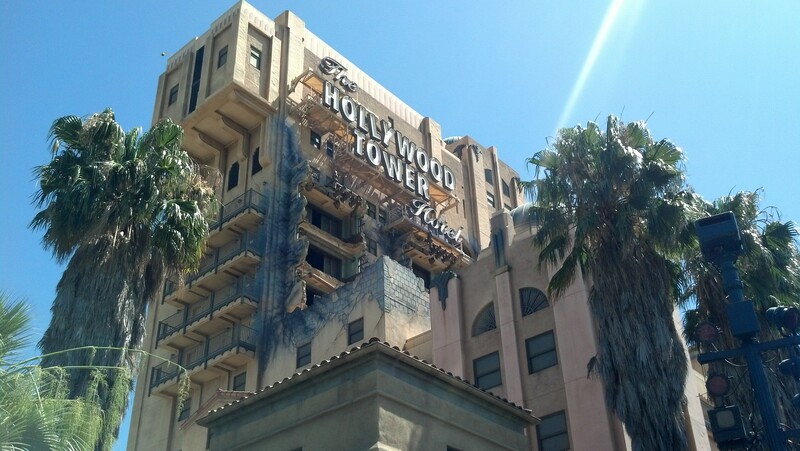 The Hollywood Tower of Terror! 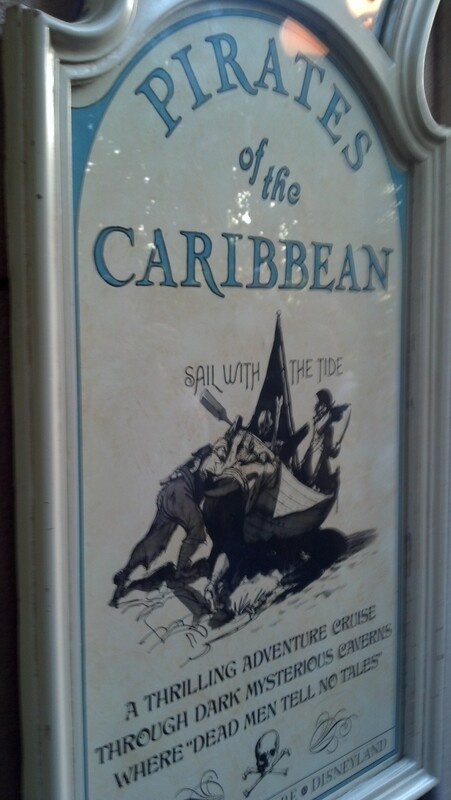 This sign hangs across from the waiting area for the Aladdin show. 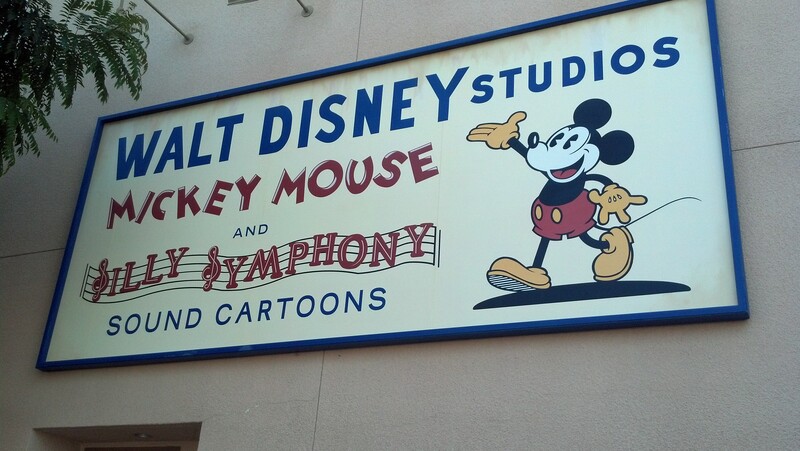 It’s a tribute to Disney’s past as this was one of our past logos. 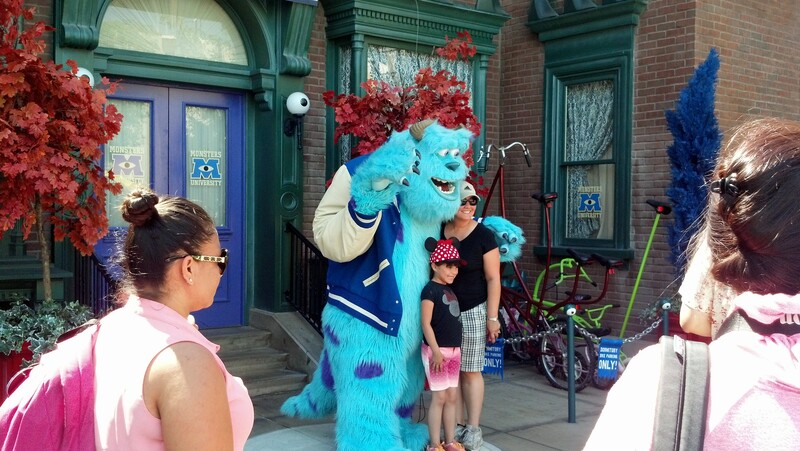 They still have the Monsters University back drop going and we saw Sulley. 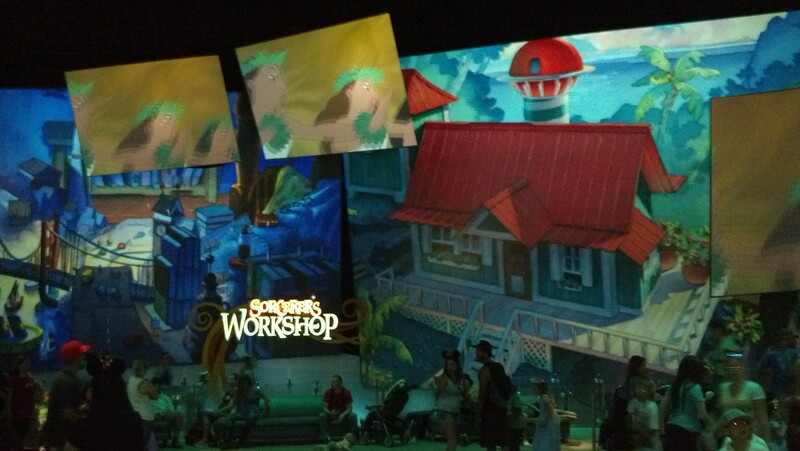 On a hot day, it’s nice to take a break inside the Art of Animation building! 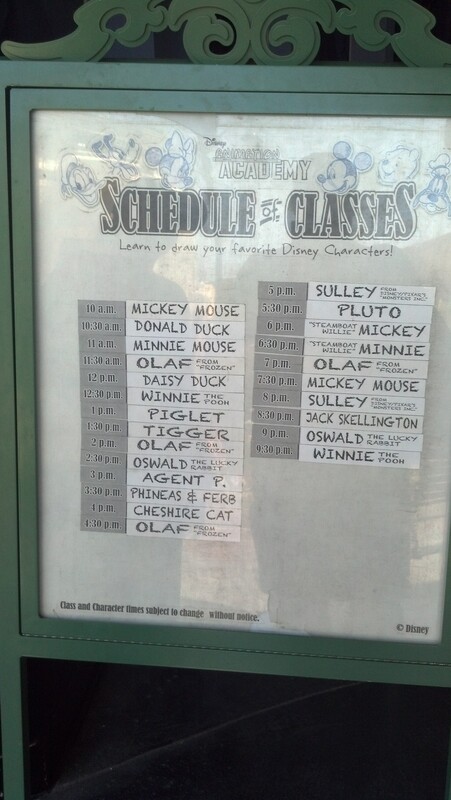 By the time we got there, we had just missed the session for learning how to draw Olaf. Oh well! I could seriously hang out here for hours. They play clips and images from various Disney animated movies along with the corresponding movies. And it’s in air conditioning! In my dream world, I would own this room. 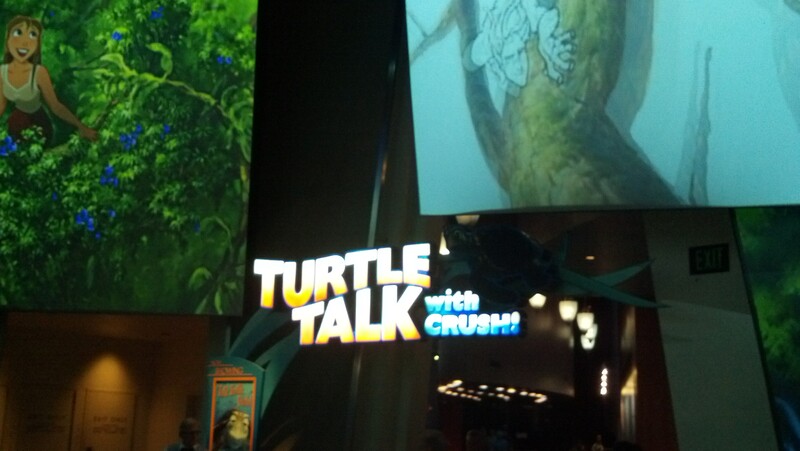 After hanging out here for a while, it was time for some Turtle Talk with Crush. This show is so much fun to me! You never know what Crush is going to talk about. I enjoy this show so much that, even though a former boss of mine offered to tell me how they make this all work, I have chosen not to have the magic ruined. So, if you know how they do this show, don’t spoil it for me. I don’t even want to know. There are two exits to the Art of Animation Building, the one we chose is through the Off the Page gift shop. 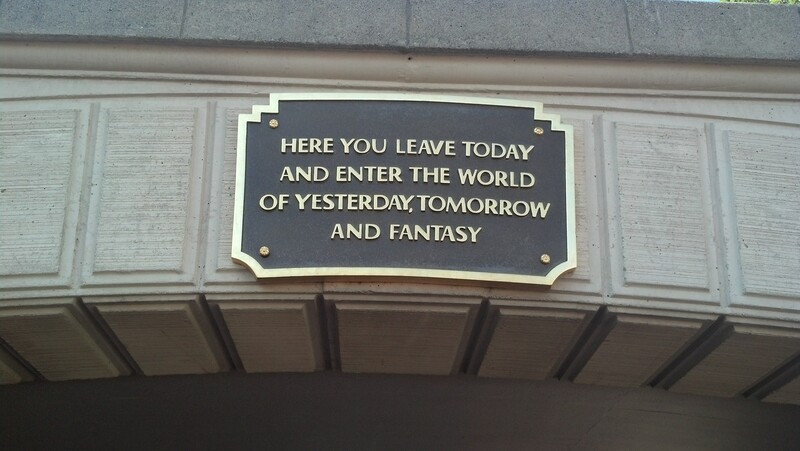 Ah, inspiration for my upcoming runDisney race registration! 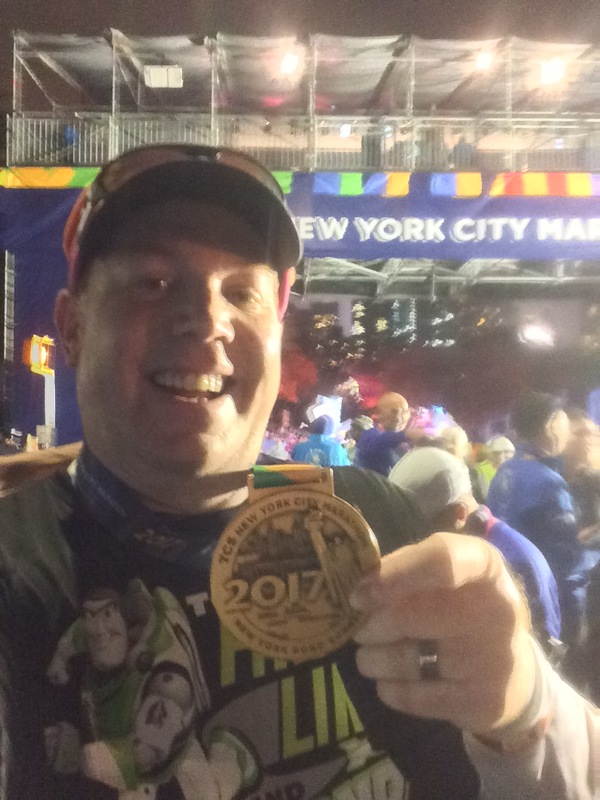 And inspiration for the last runDisney race I registered for! 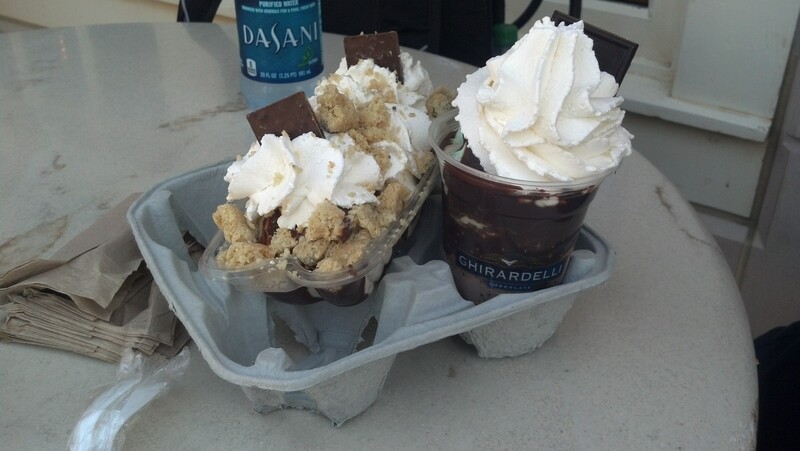 Before leaving DCA, we headed to Ghiradelli for some ice cream! Not exactly food for a runner. However, it was amazing none the less! From there, we made our way out of DCA and over to Disneyland. 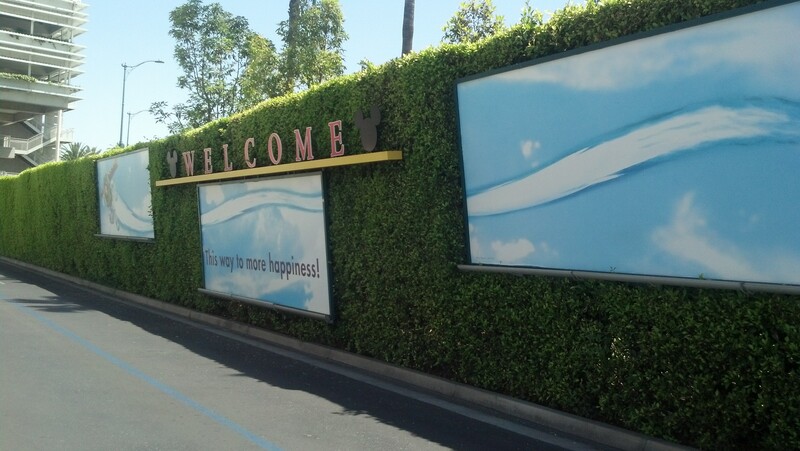 Park hopping at Disneyland is so easy! In my happy place once again! Disneyland is my favorite place on the entire planet to hang out in. Yep. I’m ready to do just that! 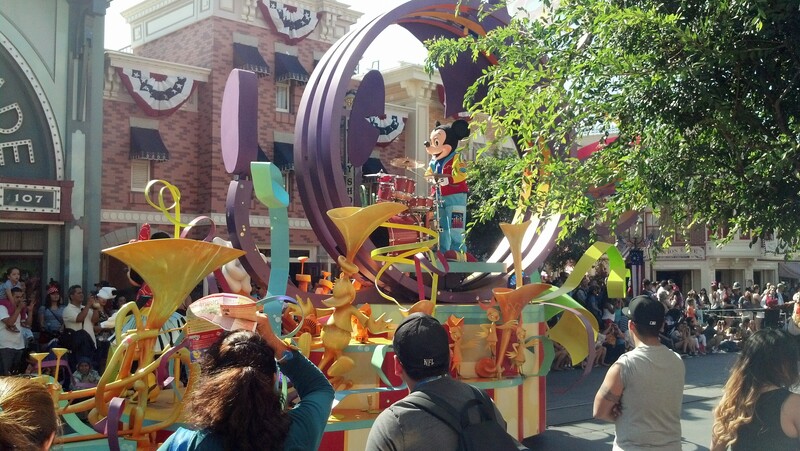 We arrived on Main Street U.S.A. just in time for the parade! We made our way up Main Street U.S.A. to Tomorrowland. 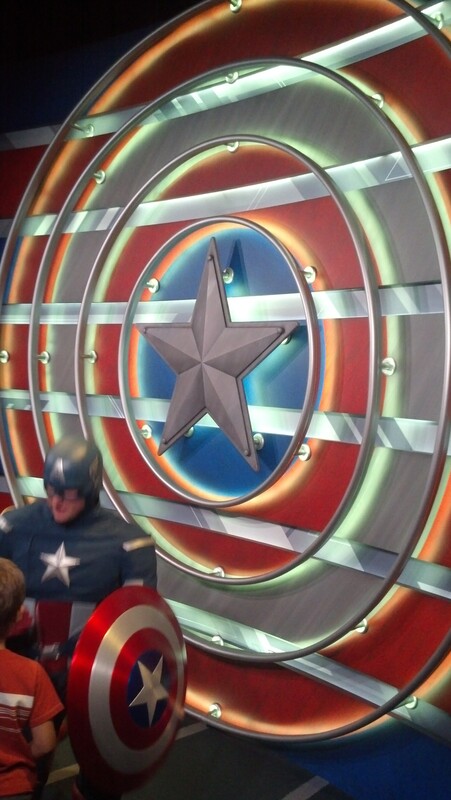 I really wanted to see this new meet-n-greet with Captain America in Innoventions. 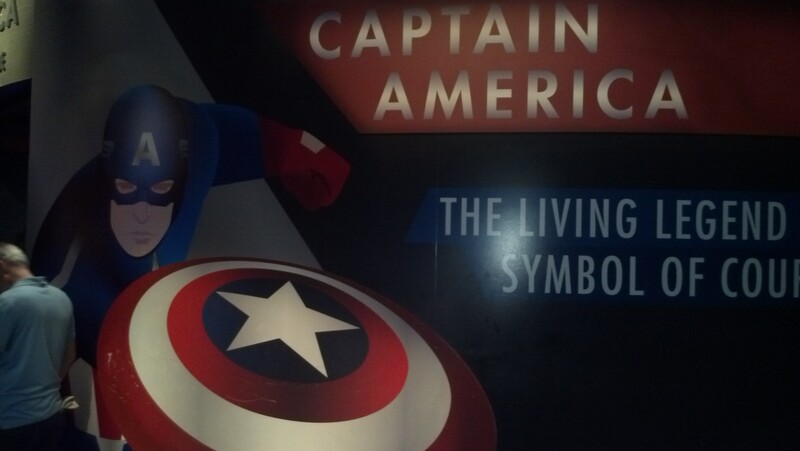 Much like the Thor meet-n-greet, they have the area pretty well themed. 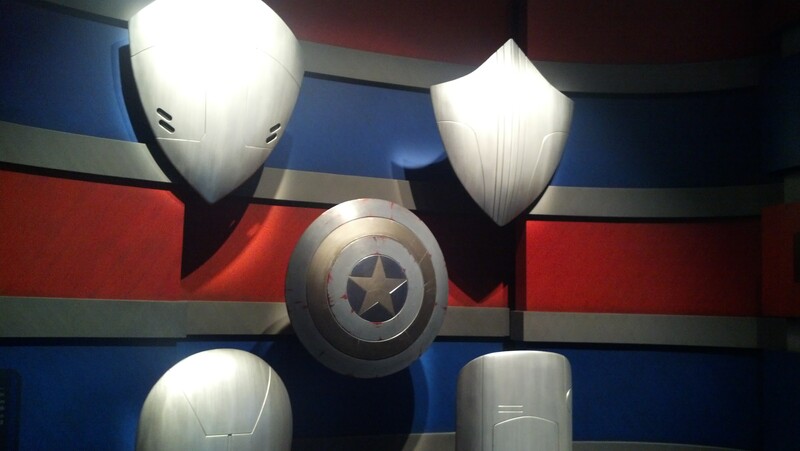 The various versions of the shield for Cap! This was a fun optical illusion! I liked the time line. 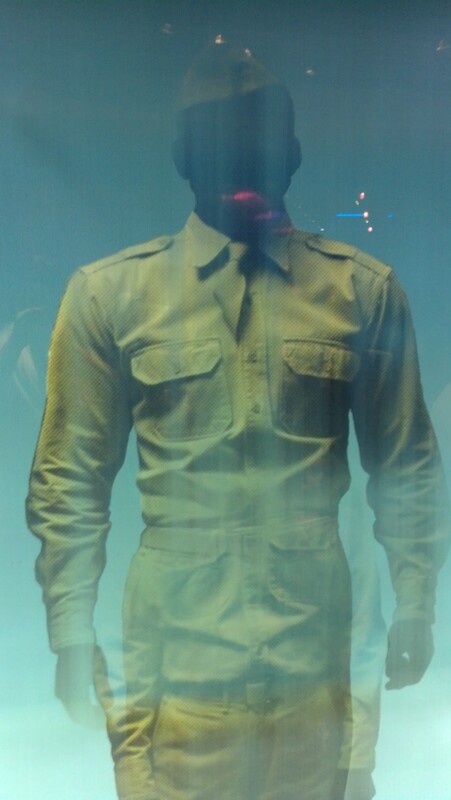 Although, it was too large for one picture. 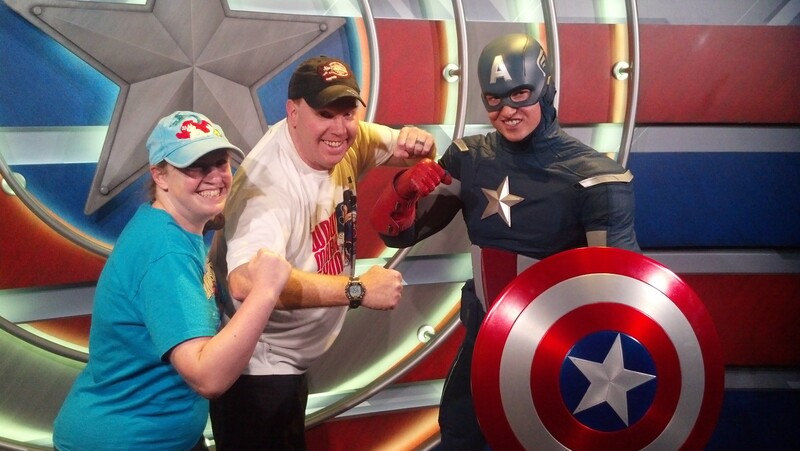 Just posin’ with Captain America. You know…no big deal. 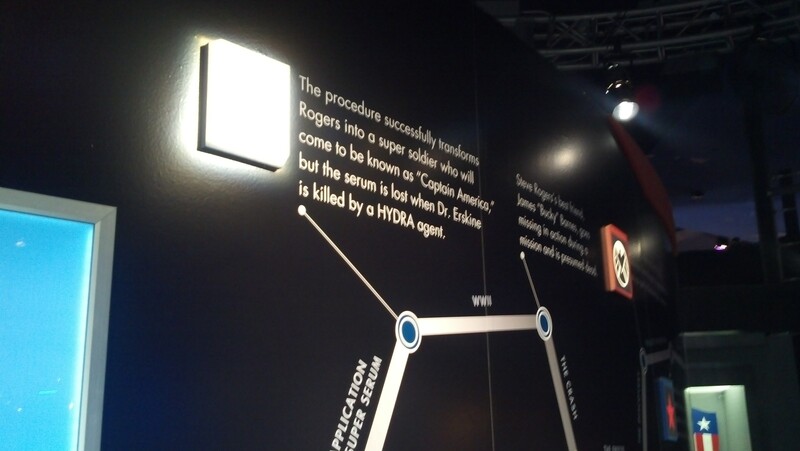 It’s too bad they don’t have a meet-n-greet with Iron Man. 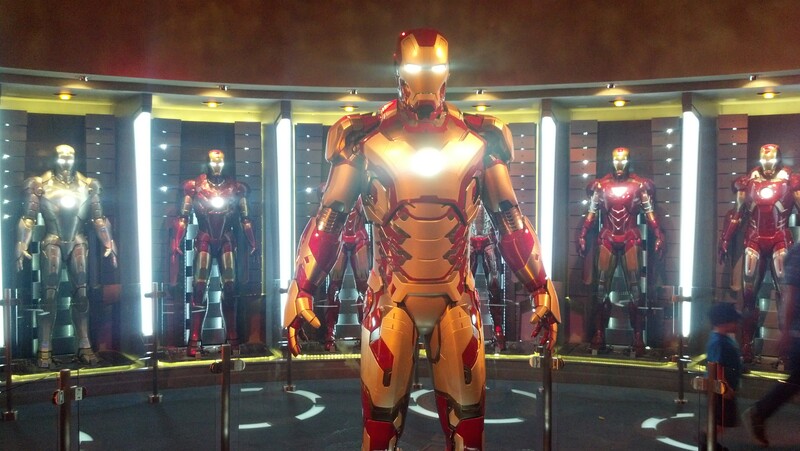 However, I still love the hall of Iron Man suits in Innoventions! 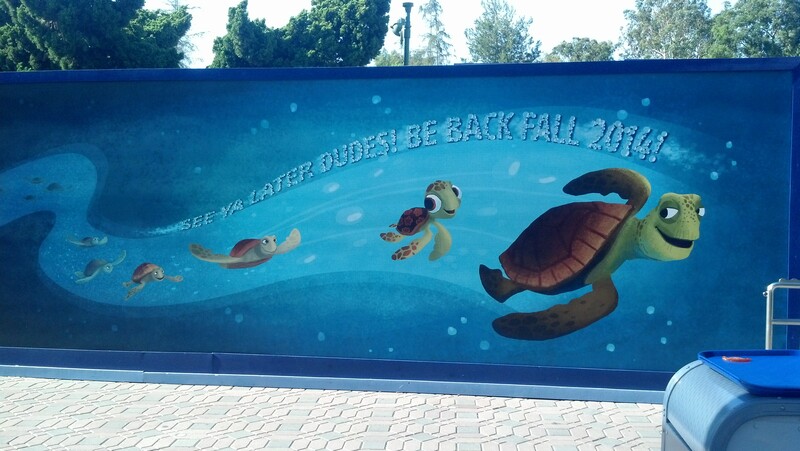 The Finding Nemo Subs was closed. I really liked the sign though. 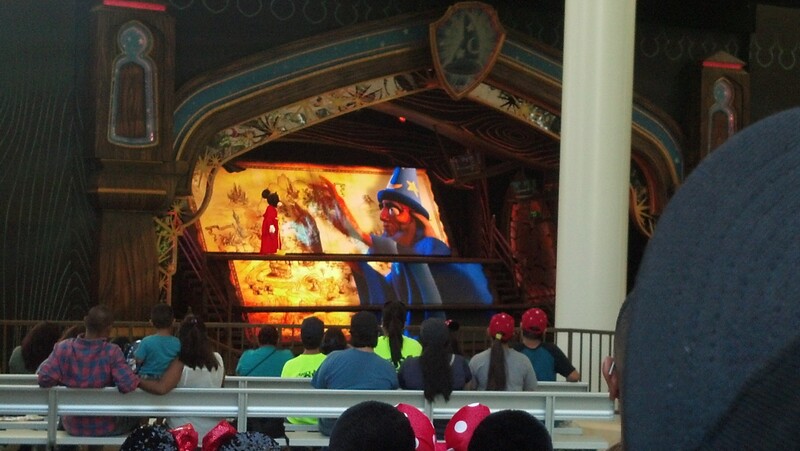 We made our way over to the Fantasyland Theatre for a showing of Mickey and the Magical Map. I loved this show! 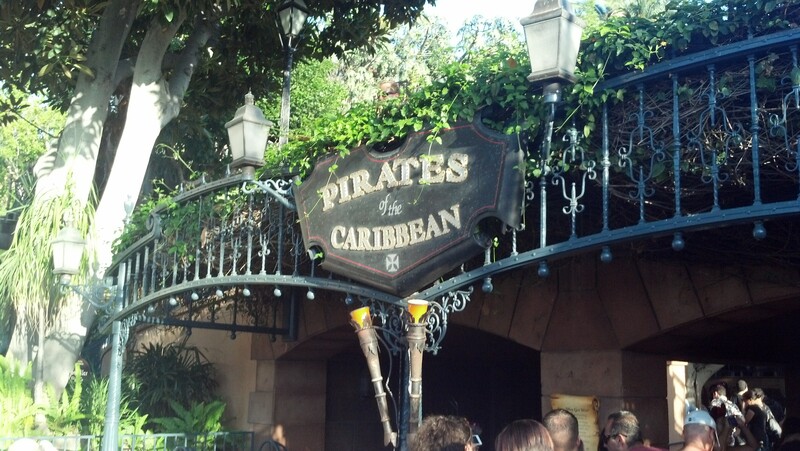 Of course, I did have to make my way over to Pirates of the Caribbean. The 45 minute wait kind of sucked. 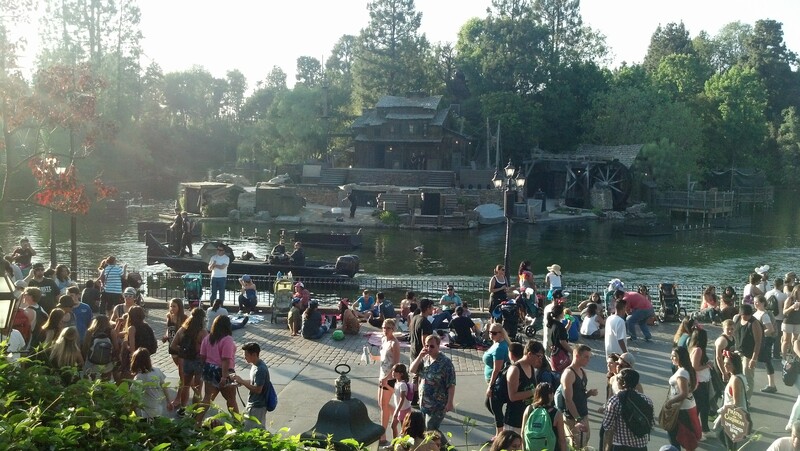 However, we did get to see them setting up the Tom Sawyer’s Island for Fantasmic. Disneyland is my favorite place to visit on the planet. It’s my happy place! Pirates of the Caribbean is my happy place inside my happy place! I absolutely love this ride! It’s kind of unexplainable. 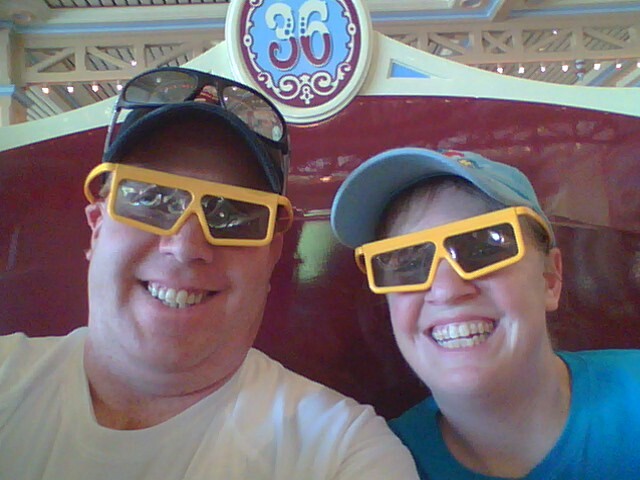 However, every time I’m on this ride, I can’t help but feel happy! While I totally love the queue line at the Magic Kingdom better, the ride itself is so much better at Disneyland. 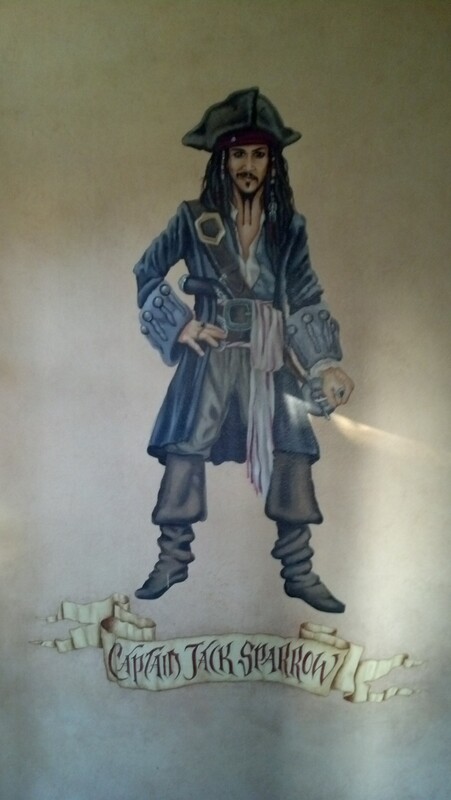 Hey there Captain Jack Sparrow! I have no more pictures to show because my phone pretty much died after Pirates of the Caribbean. After riding Pirates, it was time to find food for dinner. This is where I learned what restaurants at Disneyland you absolutely need to make a reservation at before visiting. We stopped at a few different places that were fully booked for the day before settling at the Village Haus in Fantasyland. The food was okay there. It wasn’t great…wasn’t bad. However, I would have preferred eating somewhere else. After eating dinner, we decided to brave the line at the Haunted Mansion. The advertised wait was 25 minutes, but was much less than that. By the time we got done with dinner, we realized that there was probably time for only one more ride before the fireworks. Since they would have the Haunted Mansion closed to get it ready for the Nightmare Before Christmas overlay on Labor Day Weekend, I thought we should take in the regular version this time over other possibilities. After Haunted Mansion, we braved our way through the crowds who were watching the first showing of Fantasmic to arrive on Main Street U.S.A. and stake our spot out for the fireworks. The above video is of the same fireworks show we saw, only the video was filmed almost exactly 2 years prior to this visit. Pretty cool! This video came out better than the one I attempted last Saturday. So, I thought I’d end this report with that video instead. However, this is the fireworks show they are going with for the summer. I still prefer Remember…Dreams Still Come True. However, this one isn’t too bad. Once the fireworks were over, we waited in the Hub for the masses to make their way towards the exits before heading to Jolly Holiday Bakery for our traditional chocolate croissants. The line to get food was super short which made the experience even better. We ate our desert while waiting for the crows to thin out even more. Then, it was off to the tram and to make our way home. Until Disneyland Half Marathon Weekend, good night Disneyland! 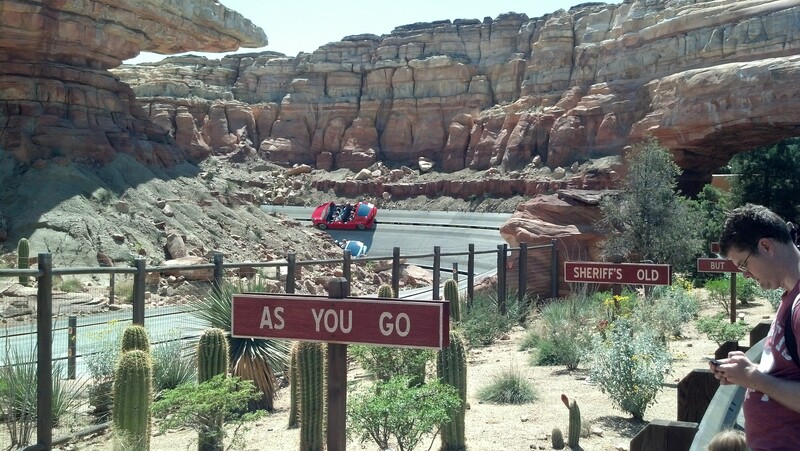 So, Radiator Springs Racers looks a lot like Test Track. Is it similar with different theming? 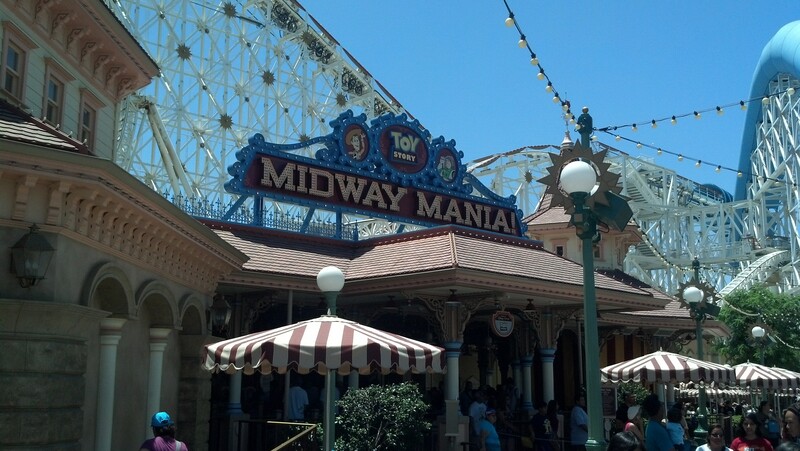 Is Toy Story Midway Mania the only headliner without FastPass there? Is it still traditional FP system there, unlike the UnMagical Bands in WDW? I’ve not had the opportunity to go on Test Track. It was either down or had too long of a line when I was in EPCOT. However, the technology is the same. A friend of mine is one of the head engineers at DCA. 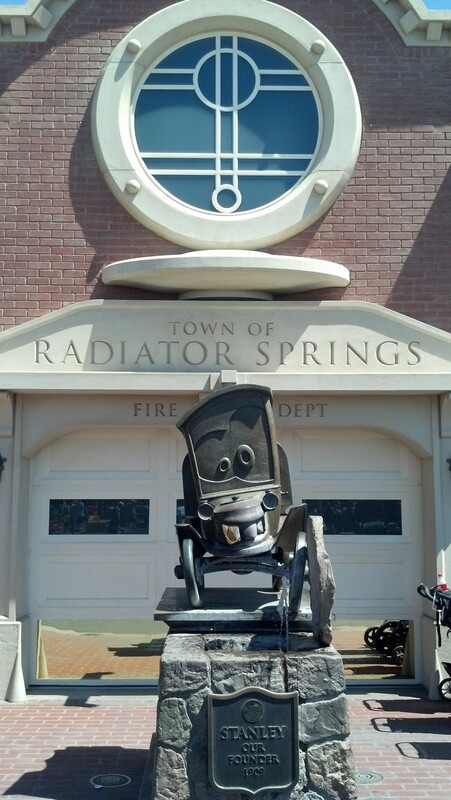 As they worked on the Radiator Springs Racers, he told me it uses the same technology. It is my absolute favorite attraction at DCA. Get there early in order to secure a fast pass for this ride. Otherwise, the wait times are really crazy. 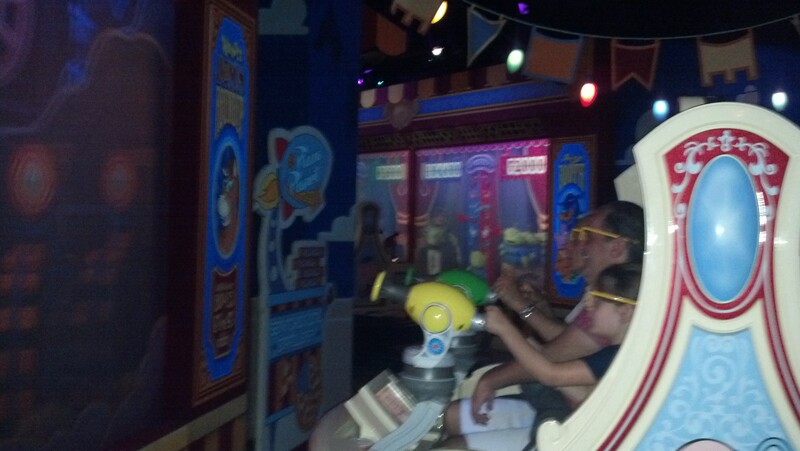 Toy Story Mania is the biggest attraction not to use FastPass. 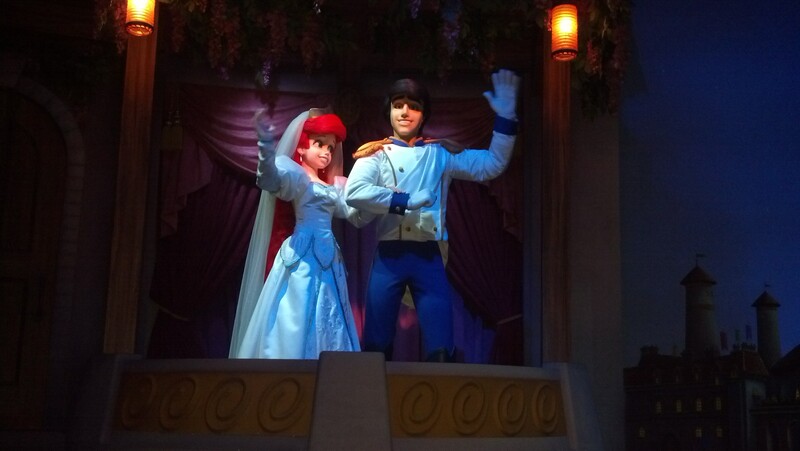 The Little Mermaid does not use FastPass either (unlike the same attraction at the Magic Kingdom). 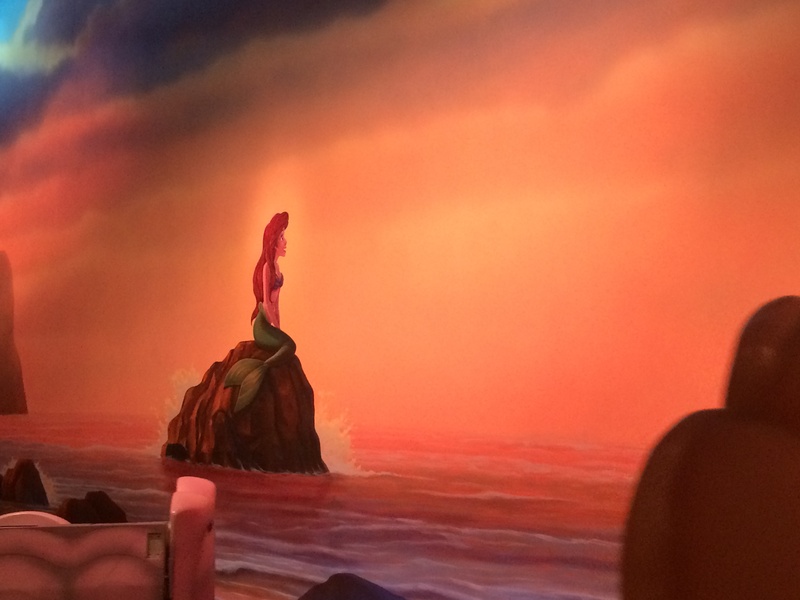 However, the Little Mermaid rarely has a wait time of more than 15 minutes. So, it’s not an issue. 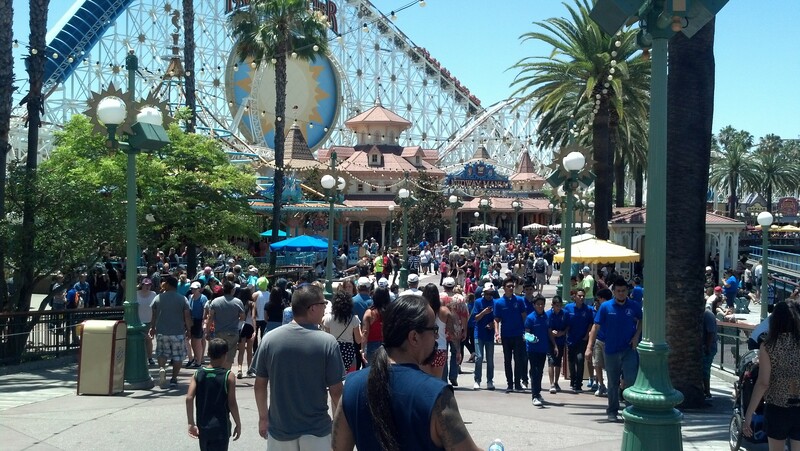 I think that Califoria Screemin’ the big roller coaster, uses FastPass. I know that Tower of Terror does. 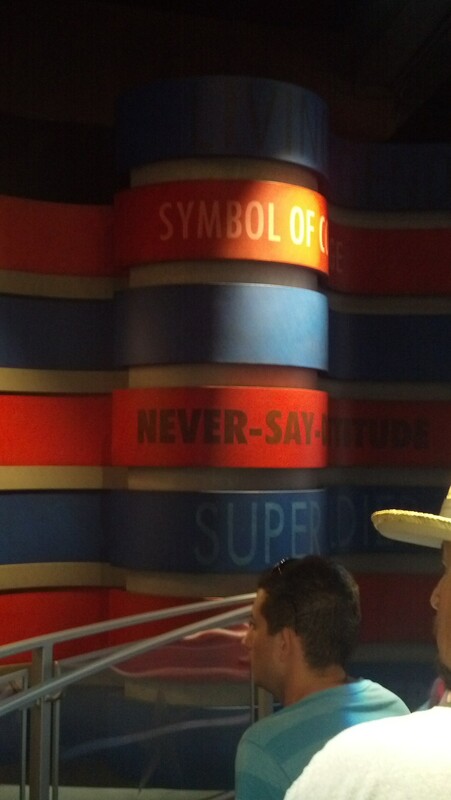 Off the top of my head, I’m not sure if Soarin’ over California has FastPass. We do still use the old FastPass system at the Disneyland Resort. There are are no MagicBands here.